Lausanne, Switzerland, December 9, 2015 - The FIVB is pleased to announce that the 2018 edition of the FIVB Volleyball Men's World Championship will be co-hosted by Italy and Bulgaria. In keeping with FIVB President Dr. Ary S. Graca F°'s mandate to promote innovation and provide new opportunities, the competition will be co-hosted by two countries for the first time in the history of the event. The FIVB Beach Volleyball World Championships The Netherlands 2015, hosted by four cities for the first time earlier this year, also announced a new trend to diversify how events are hosted. President Graça added: "We are pleased that the 2018 FIVB Volleyball Men's World Championship will take place in two countries with a long tradition of volleyball - the semifinals and finals taking place in Italy. I am sure Italy and Bulgaria, who have both already organised World Championships, will organise a competition to remember in 2018, in the same year Japan will host the Women's World Championship." FIPAV President Dr. Carlo Magri said: “We are very happy to be able to organise the Men's World Championship in 2018. Once again, the FIVB has decided to recognise the organisational skills of the Italian Volleyball Federation, highlighted by the recent events organised by the federation. To organise World Championships in 2010, 2014 and 2018 in a difficult economic context is proof of the good work done by FIPAV." The 2018 FIVB Volleyball Men's World Championship will be the 19th edition of the International Volleyball Federation's top competition for men's national teams. It will come after the record-breaking FIVB Volleyball Men's World Championship Poland 2014, which saw over half a million fans attend the 103 matches in the competition. 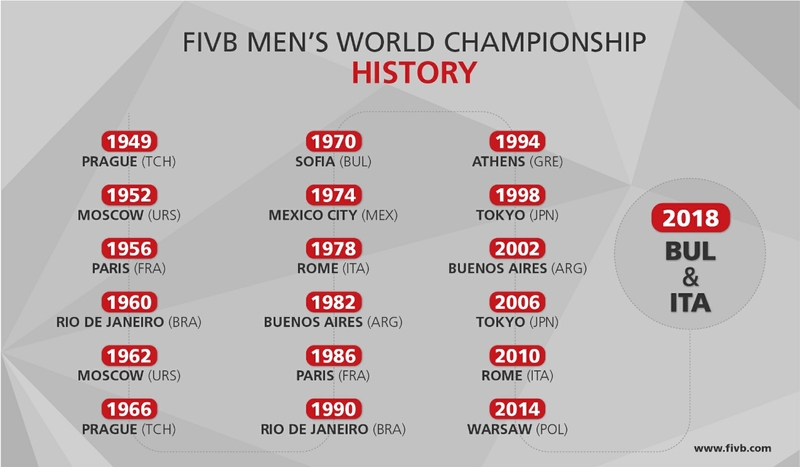 Both Italy and Bulgaria have already played hosts to Men's World Championships. Italy last organised the Men's World Championship in 2010, when Brazil claimed the title in Rome. Italy also hosted the men's event in 1978 and organised the highly successful Women's World Championship in 2014. Bulgaria, on the other hand, hosted both the Men's and Women's World Championships in 1970. The East Germans won the men's competition in Sofia - the USSR were victorious in the women's competition in Varna.